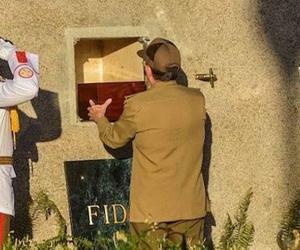 The historic leader of the Cuban Revolution Fidel Castro was interred in the Santiago de Cuba´s Santa Ifigenia cemetery this Sunday December 4, alongside the tombs of Cuba’s most exalted national heroes. At seven in the morning, the funeral procession carrying his ashes in a small, flag-draped cedar casket, travelled the streets of the Cuban second-largest city, where thousands of Cubans watched it in silence. Saturday night, hundreds of thousands of Cubans crowded the Antonio Maceo Revolution Square for the last tribute, where the Cuban President Raul Castro delivered a last speech, after the leaders of the main Cuban mass grassroots organizations spoke. Former Brazilian presidents Luiz Inácio Lula da Silva and Dilma Rousseff, joined Raúl Castro on the dais along with other Latin American leaders, like Maduro, Evo Morales and Daniel Ortega. Several of Fidel Castro’s friends, including Argentine soccer icon Diego Maradona and actor Danny Glover, also were present.